It’s almost April 29, which means the fourth concert in our Zimmermann’s Cafe series is about to be a reality. We’re always excited about these concerts because we are reminded each time how many talented composers and performers live here in South Florida. Our fondest wish is that our audiences spread the word about the music we present and also that we have a classical scene absolutely worth getting excited about. This Sunday’s concert at our unofficial home at St. Andrew’s Episcopal Church in Lake Worth features chamber pieces by Carlos Rafael Rivera (whose music you can hear right now on Netflix; he’s the composer for Godless, starring Sam Waterston, Michelle Dockery and Jeff Daniels), Michael Bies, Dennis Kam, Dorothy Hindman and Robert Hebble. This time around we’re featuring vocal music for the first time, presenting two pieces by Robert, one of them his own and another an arrangement of an organ prelude by J.S. Bach, who is sort of the spiritual father of the Zimmermann’s enterprise. All of the music we’re presenting is going to be absorbing and worthwhile, and we feel privileged to be able to bring it to the attention of a wider audience. It’s not easy coming up with the funding to pay for all this, but luckily we’re a 501(c)3 nonprofit for which contributions can be written off. This Tuesday, April 24, Palm Beach County is taking part in the Great Give, a 24-hour fundraiser for county nonprofits like ourselves. We’d appreciate any help you can give us so we can continue to mount concerts of music by local composers. If you’re looking for a worthy cause to donate to on Tuesday, please give us a thought. Any and all contributions are welcome. If you’re in town this Sunday at 4 p.m., stop by and hear some good local classical music and have some of our free sandwiches, sweets, coffee and wine. We’ll be happy to see you, and to have you take part in the dialogue between pieces. 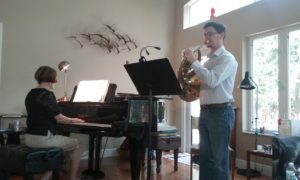 Carolyn Morgan, pianist, and Jacob DiEdwardo, hornist, rehearse earlier this month for the Zimmermann’s Cafe concert. 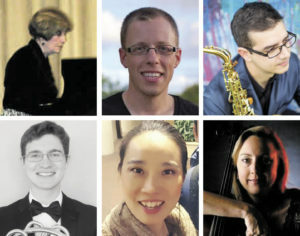 We’re getting closer to the second concert in the inaugural season of Zimmermann’s Cafe Chamber Music, which is set for Sunday, April 30, at St. Andrew’s Episcopal Church in Lake Worth, and all of us composers in this concert couldn’t be more excited. 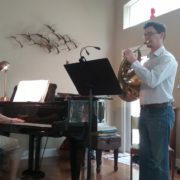 Pictured above are hornist Jacob DiEdwardo and pianist Carolyn Morgan making their way through the second movement (Rhapsody) of the Horn Sonata by Greg Stepanich (that’s me). I wrote the first version of this piece 20 years ago, and did a lot of updating, cutting and rewriting late last year and earlier this year to get it into performable shape. Jacob and Carolyn sounded just wonderful in rehearsal earlier this month, and I think the piece will come off well. I’m so grateful to them for taking this piece in hand and doing it so professionally and so well. Thanks from the bottom of my heart. I’m even more excited to hear the other pieces on the program, for which I’ve seen the scores, and they’re going to be excellent. We have a wide variety of contemporary American music from South Florida on this program, and we are delighted to be hosting this series and seeing so many people come out. Concert series like this have to be organized so that this music can reach a wider audience. We have a very impressive contingent of classical composers in South Florida, but their work is not all that well-known outside of academic circles. And speaking for the other composers on this program, this is worthwhile, engaging, exciting and interesting music written by people who are experts at this difficult art form. These are significant American voices, and they deserve to be appreciated and heard. Now for some breaking news: We’ve applied for our 501(c) 3 status, we’re officially registered with the state, and we’ve already entered the running for a grant to help us continue this series. Soon, we hope to hear good things from the IRS and the grantors, and we’ve already begun work on ideas for Concert No. 3, probably in October. As for the coming concert, rehearsals are going well, we’ve ordered all the food that we’ll need for our hungry patrons, and we’re looking forward to a fine afternoon of artistic fellowship with some of the most interesting audience members you’ll find anywhere. Here’s another link to our Facebook page for more info, and we’ll see you on the 30th! We’re excited to announce the repertoire for the 4 p.m. April 30, 2017, Zimmermann’s Café Chamber Music concert, which will be held at St. Andrew’s Episcopal Church in Lake Worth. 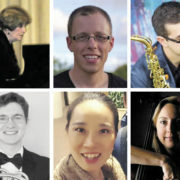 Performers include Eerang Ahn, piano; Susan Moyer Bergeron, cello; Jacob DiEdwardo, horn; Dannel Espinoza, saxophone; Carolyn Morgan, piano; and Eric Rucker, vibraphone. We’ll update with more information as the days get closer to our performance. We’re very grateful for the support we received after the first concert in October, and we’re delighted to be going forward with Concert No. 2! We’re applying for nonprofit status, and we’ve also applied for a New Music USA grant to buttress our mission of presenting music by South Florida composers. Make sure to like us on Facebook at https://www.facebook.com/ZimmermannsCafeChamberMusic/ and check in there for more photos, comments, and the like.